the man with whom i went pedalling at the weekend spends many of his working hours sitting atop the control tower at islay international airport, and is thus more au fait with climatic and weather conditions than most. not unnaturally, many of the weather details, such as windspeed, are recorded by sophisticated equipment dotted about the external cornices of the tower and fed to the authorities and websites that deal in such minutiae. the chap who keeps the streets of bowmore free from unsightly rubbish is regularly on his rounds as i traipse down to the office of a morning and i cannot deny that, perhaps because of his outdoor lifestyle, he is also well versed in approaching weather systems. of course, such meteorological knowledge and a wicked sense of humour has served to disappoint of a weekday morning. for if office work is the daily diet, while looking forward to some velocipedinal escapism at the weekend, there is little more soul destroying than to be informed on a tuesday morn that one has little chance of sunshine and flowers come saturday and sunday. fortunately, more often than not, it turns out that his warped sense of humour is intent on playing on my desire for a pleasant weekend's cycling. you can't help but admire blokes like that. the most recent issue of our local newspaper had many a word to spread regarding the hurrican force winds that damaged rather a lot on the isle at 06:00 on tuesday 3rd january. from the assembled information, i have discovered that winds over 74mph are classified as hurricane force (i did not know that), so the published windspeed figures for that very morning from islay airport confirmed the classification by displaying a gust of 97mph. however, my cycling colleague from the control tower was able to inform me that windspeed figures from the airport are sampled only every half hour, leaving plenty of room to manoeuvre in between. common consent amongst those of us who failed to sleep through the hurricane is that the wind reached a more forceful trajectory than that recorded by the airport, supporting evidence being at least partially confirmed by the fact that the wind speed recorder on orsay lighthouse, off islay's southwest coast, broke at 120mph. the upshot of all this, as if i hadn't mentioned it before, is that the inner hebrides experience winds that would bring tears to the eyes of a statue. this is not, however, a plea for clemency on behalf of the battered few, nor is it a long-winded (pardon the pun) attempt to elicit sympathy or admiration from the less breezed upon. it is, in fact, a display of the undoubted credentials qualifying my location as one eminently suitable for reviewing garments described as windproof. i know that you never really doubted me for a minute, but it's always good to reinforce these feelings of goodwill in case one or two of you haven't hung around these here parts too often. bbb cycle clothing of holland via their uk distributors windwave (colnago, fsa etc) kindly despatched a mistralshield lightweight windproof jacket for review on this draught ravaged isle (and just to be blunt, no matter what you say on twitter, 15mph does not constitute a headwind). as any magician, drummer or humourist will tell you, timing is everything, a factor that sadly mitigated aginst this review for many days too long. for the mistralshield is very lightweight (i have used thinner toilet paper) and advertised as featuring only a water repellent coating. though i have neglected to involve any type of precipitation in my opening monologue let me assure you that large quantities often accompany those searing winds. thus, with a combination of both wind and rain pervading my christmas holiday riding, water repellent was less than i was willing to leave to experience at that point in time. now that those winds have dropped to their more regular 25-30mph conditions, i adjudged it safe to venture forth clad in the bbb mistralshield windjacket. at this point, the verdict is surely a simple one: is it windproof or isn't it? happily, it is indeed; very much so. slogging into a headwind for 12 kilometres is, by my reckoning, a fairly comprehensive test, and even allowing for the mesh panels down each side and under the arms, such a sliver of material does a remarkably comprehensive job of keeping all manner of winds at bay. 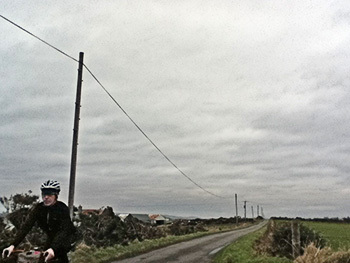 of course, headwind slogging took place more often than just the once, just to make sure. what it doesn't do, and i must point out that nobody said it would, is keep you warm. 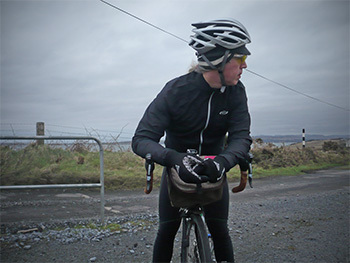 fending off a headwind or crosswind will doubtless retain a degree of internal warmth, but those mesh panels allow all that to evaporate the minute pedalisation comes to a halt. it would therefore be a prudent move to ensure adequate cladding below the jacket in order to stave off the chills, should a mechanical or puncture afflict forward motion. however, the clue as to its true purpose in life is contained within the built-in container. 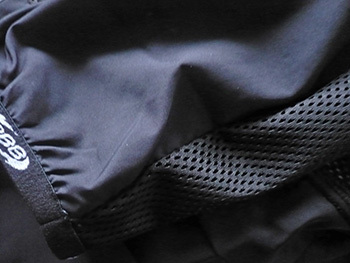 the jacket's single, velcro'd rear pocket doubles as a pouch; on a windless day (snigger) the mistralshield can be simply stuffed in a rear jersey pocket for emergencies. i have singularly failed to get the jacket wet, simply because islay's weather has been uncharacteristically dry over the past week or so. therefore i'm unable to confirm the veracity of that water repellent coating, though since nobody fibbed about the windproofing, i doubt they'd undermine the sales pitch by fibbing about precipitory protection. when it comes to employing the jacket as a windshell over more thermal cladding, the world is greatly improved by the fit. cycle clothing inhabits one of two styles nowadays: normal or race-fit; the mistralshield coming under the former, yet manages not to act as a sail during those salient moments. if i absolutely have to find fault, it's that rear pocket that gets the blame. the pocket size is well judged, and the outer flap offers to protect the contents from dripping rain, but the velcro fastening is the feature that gives minor cause for concern. reaching into that pocket while riding, the hook and loop fastening had a predatory habit of closing again before any fingers could grasp the hoped-for contents. yes, it is a minor gripe, but other than that i can see little reason not to consider this excellent item of cycle clothing to shield body and soul from that insidious and perennial wind. 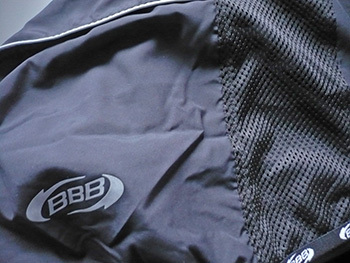 the bbb mistralshield windproof jacket is available in black, blue or white, in sizes small to xl for a retail cost of £49.95.